By word of mouth and through friends, they found their new home, which was built in 2007 and featured details such as antique doors, old Chicago brick and pine floors. “The major draw of the house was the location and the space for the family, ” David says. “It was a great, open coastal layout that allowed for entertaining both inside and out.” The house’s appeal for Jeramy was the smell of the pine floors, the sunlight pouring in through the windows and the privacy of the surrounding woods. In June 2013, after painting every inch of the home, they moved in. 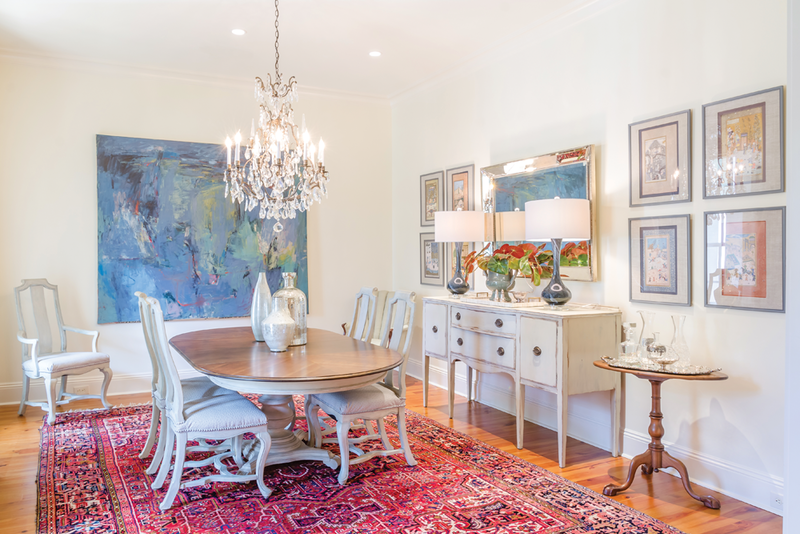 Best friends Jeramy Neill, left, and designer Virginia Volman worked together to create homey spaces for the family. 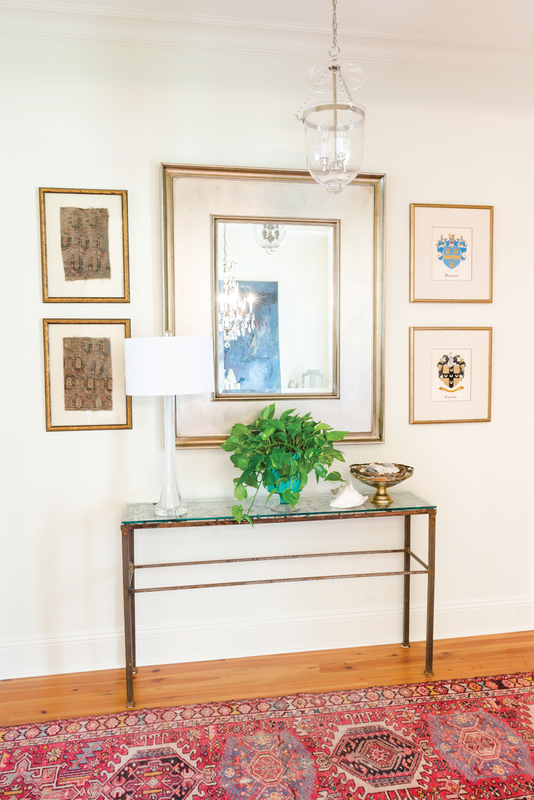 ​Jeramy had consulted her best friend and designer Virginia Volman when it came to decorating her Birmingham house, so she again commissioned Virginia for the Fairhope residence. “She wanted the new place to be her oasis, and I began my work again, ” says Virginia. 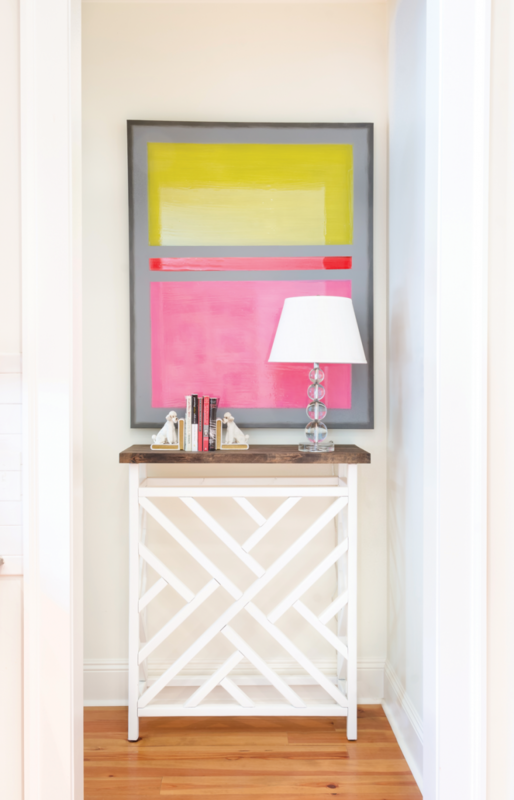 She strived to bring a more vibrant aesthetic with fresh paint, grasscloth behind the shelving and modern lighting. Jeramy adds that during the decorating process, her highest high was met with her lowest low. “I lost my mother suddenly in 2014, but with Virginia’s guidance, I was able to incorporate some of my mother’s keepsakes [into the decor] that took our home to a deeper level, ” Jeramy says. “I find great comfort in the stories behind the furniture and artwork.” And she never tires of sharing those memories with friends when they visit. Indeed, the house makes entertaining a breeze for the Neills. Music plays throughout the main house. The adults cook in both indoor and outdoor kitchens that flow seamlessly to living areas where the children scamper about. When she’s not hosting, Jeramy loves to work in the yard, grab coffee with a friend or walk with a neighbor. The kids catch frogs, run and chase the dogs and gather the other neighborhood children for kickball or swimming. 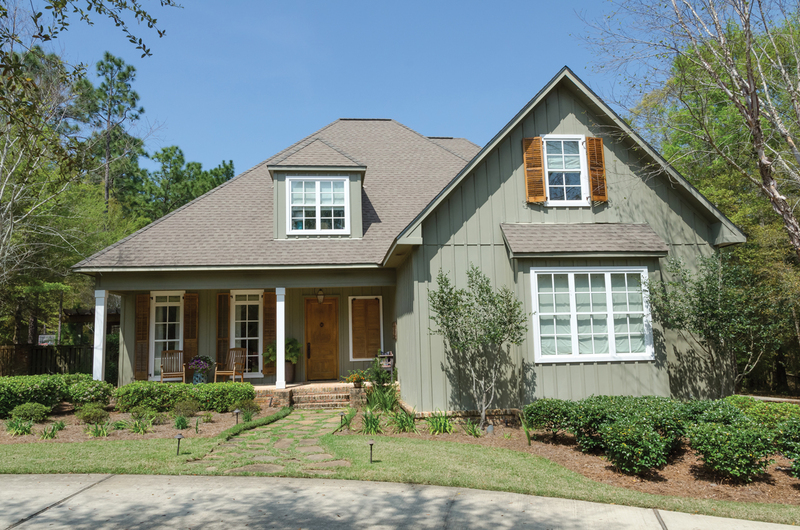 Virginia went on to work with Jeramy’s sister and another friend to assist in feathering their Fairhope nests and in the meantime ended up with a Fairhope cottage all her own. 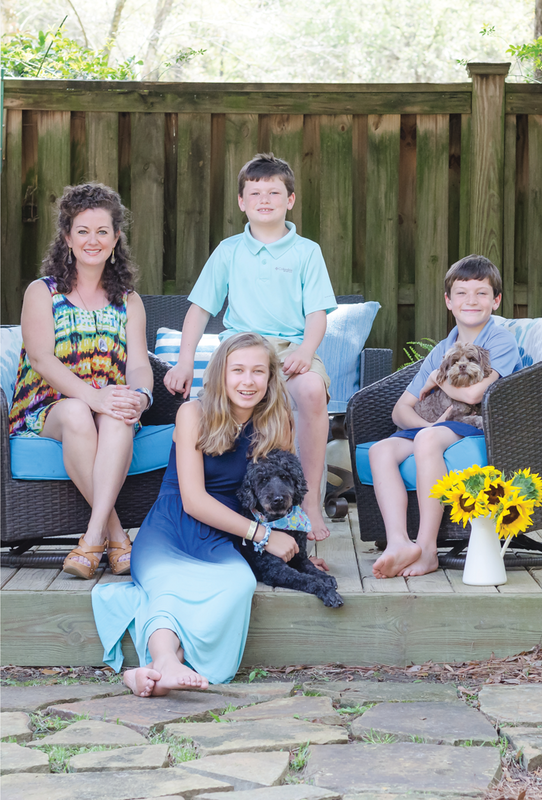 “I fell in love with the town and wanted a place to summer with my girls and be with Jeramy and her kids.” Likewise, Jeramy gets the best of both worlds: her Birmingham bestie right around the bend in her now beloved Fairhope. ABOVE For the living room, bamboo chairs were reupholstered in a peacock blue performance velvet for everyday living. “I grew up sitting in these chairs with my parents, and the sound they make when you sit down brings back memories, ” Jeramy says. The recovering and pillows brought them to the 21st century, but they still give Jeramy a feeling of home. Grass cloth provides a backdrop to the display of books, art, pottery and family photos. 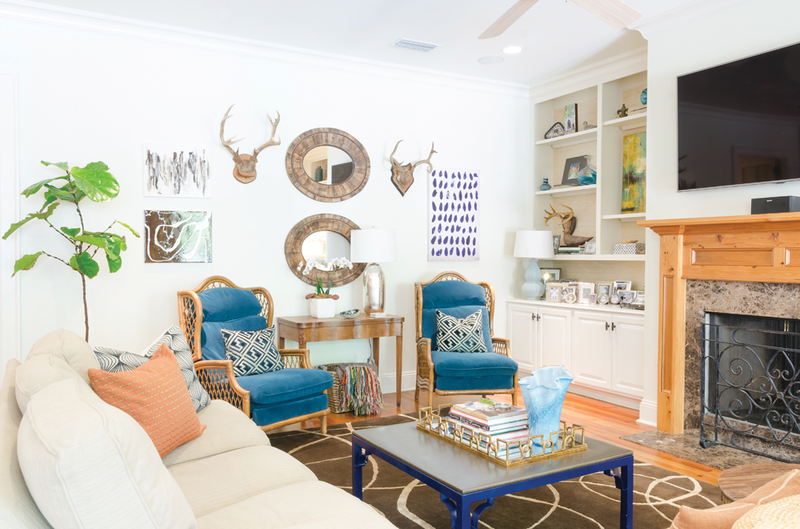 The antlers were an eBay win, and Carrie Pittman art hangs beside them. ABOVE LEFT A collage of children’s art surrounds a Neal Turner piece in the breakfast nook. Simple white frames and mats make the colorful artwork pop. The family gathers for meals around a farm table they had built for their kitchen nook. An assortment of textiles cover the pillows along the bench that runs along the windows. Jeramy found the antler chandelier on a shopping trip in Jasper, Alabama. 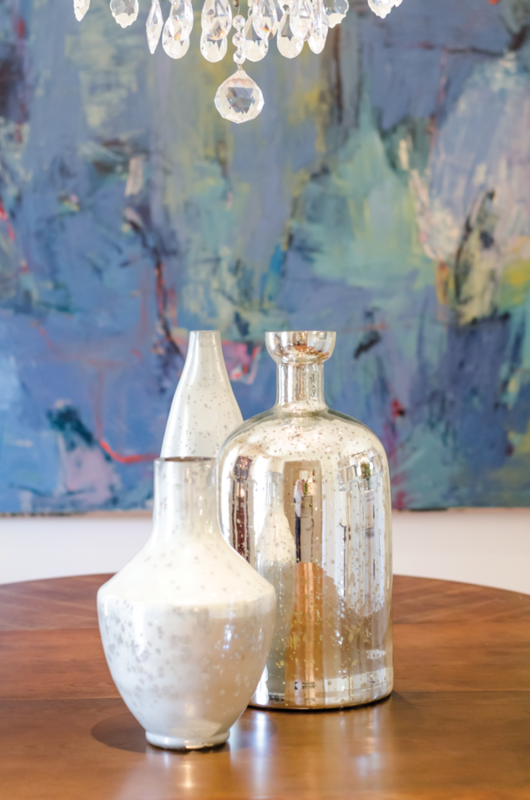 ABOVE RIGHT A mercury glass trio serves as the centerpiece on the dining table. 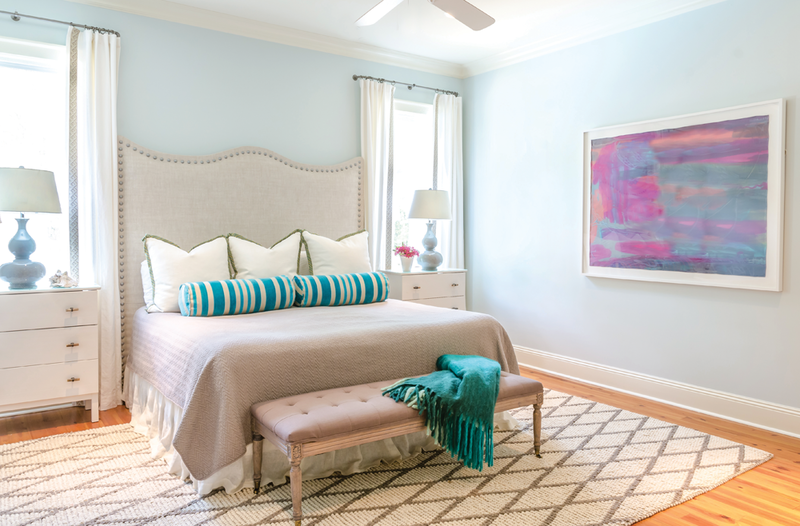 ABOVE On a trading site outside of Montgomery, Virginia found the exquisite and oversized blue painting. It was really old, and Jeramy had to rent a U-Haul to get it home, but the piece makes a statement. “It looks as if it were made for the wall, ” Virginia says of the unsigned work of art. Chairs with ostrich skin-covered seats surround the French country dining table. The china cabinet and sideboard were Jeramy’s grandmother’s. On a hunt in her mother’s attic, Jeramy found the Asian art now framed around the mirror. She updated it by covering the mat board in leftover linen from the master bedroom headboard and painting the frames. The walls, trim and ceiling in all the main living areas are painted Seashell by Benjamin Moore. ABOVE LEFT A hallway table was made from old butcher block from their Birmingham house. 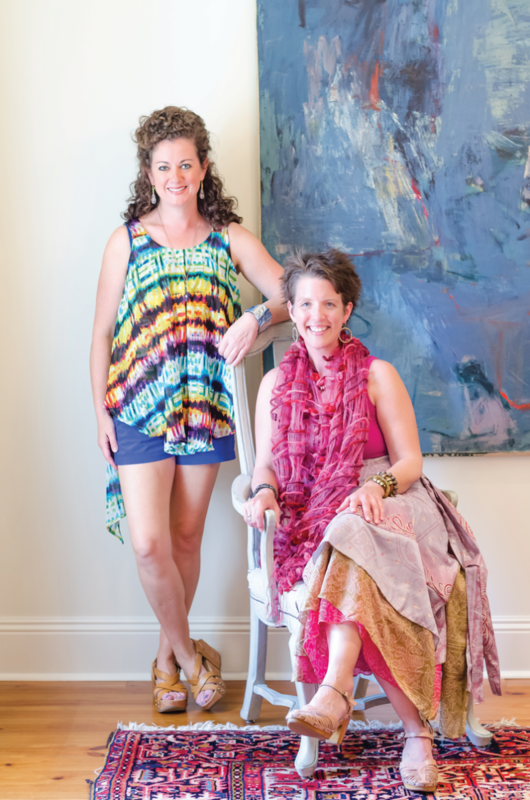 The colorful abstract painting was found at Living Well in Fairhope. ABOVE RIGHT Jeramy also found original oils of family crests in her mother’s attic. Thomas was her mother’s maiden name and Waggener was her grandmother’s maiden name. Remnants of an old antique oriental rug are framed on the wall as well. The light fixture came from Shades of Light. ABOVE The master bedroom headboard was made and covered in linen. Jeramy dressed up side tables from Ikea with custom glass tops and antler husk knobs from Anthropologie. A bold, painted silk is framed in crisp white. ABOVE The Neills converted an old garage into a pool house. A new mahogany door replaced the old one, and egg chairs allow for comfortable pool house porch swinging. “I want my home to be where the children gather, where everyone wants to come, ” says Jeramy. 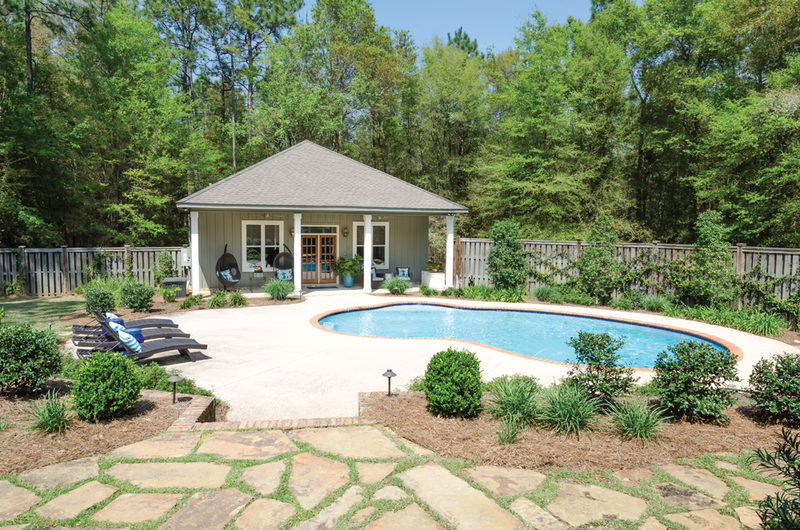 ABOVE LEFT An Ikea kitchen makes the casual, kid-friendly pool house even more functional. All of the art on the shelves are original pieces by the Neill children. 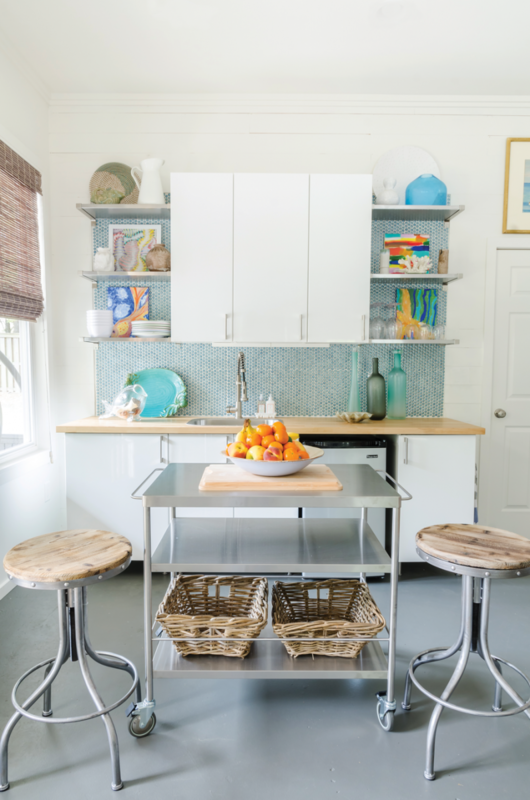 ABOVE RIGHT Boat cleats serve as hooks for towels, clothes and bags in the mudroom where the family and guests can change. It adjoins a full bath. 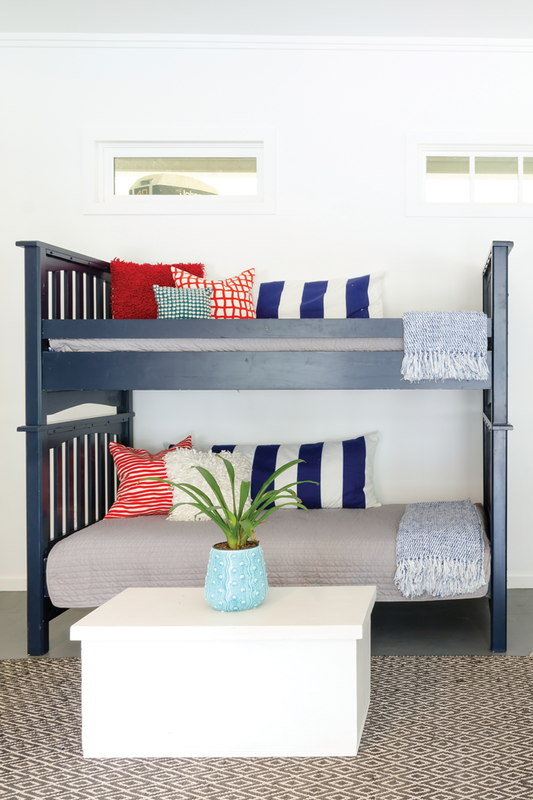 ABOVE LEFT Bunk beds from Pottery Barn were in the boys’ room in their Birmingham home and create sleeping space in the pool house. Shiplap adds texture to the walls, while the floors are painted concrete. ABOVE RIGHT Jeramy and her children — Annie, 12; John Thomas, 10; and Billy, 8 — lounge in the relaxing outdoor space that her husband David built. Camille, a black standard poodle, is 16 years old; the couple got her the first year they were married. The other family dog is Coco, a cockapoo.